Image: Could tattooed labels on fruit and veg be a sustainable answer for the fresh produce industry? Image reproduced with permission from Laser Foods. Tattooing labels on fruit and vegetable items could become a norm as the fresh produce industry seeks an alternative to traditional stickers. 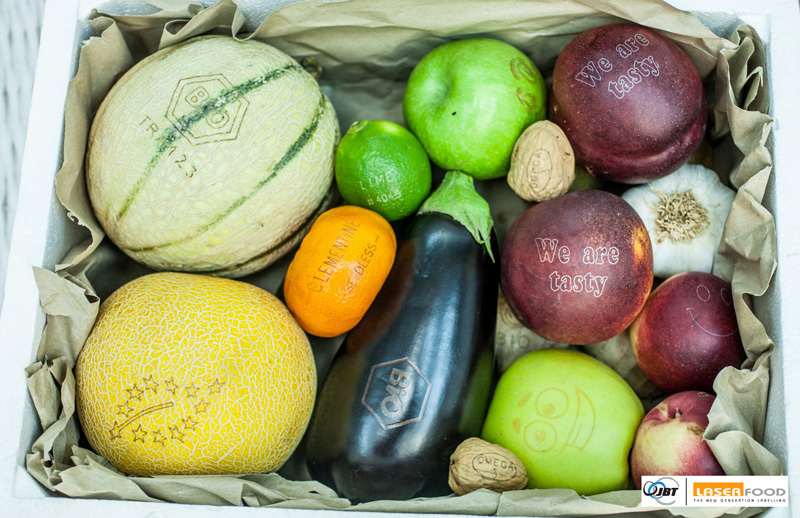 Spanish-based company Laser Foods has developed a technology that can tattoo custom labelling directly into the skin of fruit and vegetables. Their machines use lasers to ‘print’ a label on the skin of produce without affecting eating quality or shelf life. The technology can be installed into packing rooms and uses conveyor belts to feed items into the machine, where the labels are printed on the produce before it is packed and dispatched. The printing process takes a fifth of a second per piece of fruit or vegetable. In 2014, it was reported that UK retailer Marks and Spencers used 7 tonnes of individual labels on loose fresh produce items. Identifying a way to avoid sticker labelling reduces the environmental footprint involved with producing, sourcing and applying labels, and presents exciting new marketing options for growers and suppliers. With growing consumer interest in food traceability, sustainability and nutrition, tattoo labelling could be used to provide the information customers are looking for including place of origin, brand and even use by dates. It also opens the door to promotional campaigns such as marking pumpkins for Halloween and making fruit more appealing to children. The technology has appeal for growers of certified organics who are seeking a way to differentiate their produce from non-organic items. Loose produce sold without packaging – such as apples and bananas – is notoriously hard to segment from its conventionally grown counterparts, but tattoo labelling could offer a realistic solution. As part of a Nuffield scholarship, Queensland Banana grower Matthew Abbott investigated labelling options as part of a search for more suitable packaging than traditional sticky labels. As an organic grower, he was also looking for a way to separate his produce from conventionally grown bananas. ‘One of the big problems that we have at the moment is being able to brand our fruit so we can sell conventional and organic side-by-side in the shop’ he said. Mr Abbott had already considered several alternatives including printing ink logos directly onto the skin of bananas. During his Nuffield Scholarship travels, Mr Abbott came across the Laser Food technology and is now in talks with the company to develop a system that could be incorporated into his packing system. ‘The technology can be there but if you haven’t got a system around it that can be functional when it goes into your shed it can be just too hard to make it work’.